Finally, after failing to launch the boat at the end of last season, we managed to dip Saffron's toes in the water this morning for her first 'sea trials' - a light row in front of the sailing club down on the Exe. Despite the desperate flailing of a poorly trained crew and her inadequate skipper, Saffron acquitted her self with casual elegance, drawing very admiring comments from our fellow salts. A rigging session is next and then we hope to have an official "launch" in the next few weeks, though some of the crew are skiving off, pretending to have exams and other minor inconveniences. Great stuff wilddog - congratulations on getting her launched! Was thinking of naming her "± 3/8 inch" which seems to be the general level of construction tolerance in my boat shed! Still, as you pointed out when I called in for help one day, "she'll be better than a hollowed out log"! I am hoping to haul up the sails over this weekend for the first time. Fingers crossed, but you may need to arrange for me to be picked up in France if things don't go to plan. I took Saffron out for a full rig sailing test today and she passed with flying colours. With the aid of a couple of salts I put a reef in the main, even though I was sallying forth in very light airs, I thought it wise - or should I say, others thought it wise - that I should reduce my sail to get a feel for the boat and iron out some kinks in my technique. After some initial floundering - main due to the fact that I was setting out in the lee of the sailing club - Saffron soon took over and more or less sailed herself. 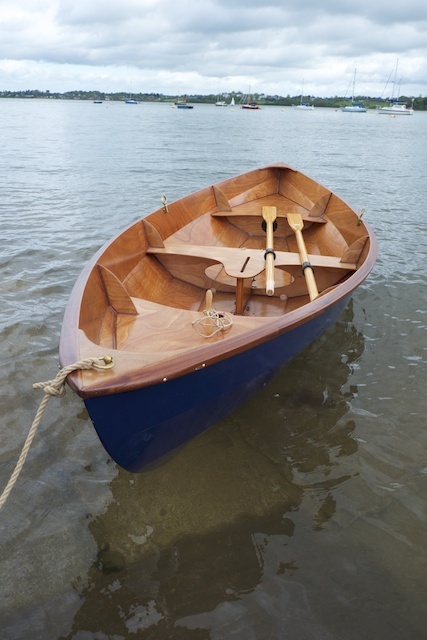 A fellow club member crept up to offer some encouragement in a very tidy looking Tideway and congratulated me on a manoeuvre that I am told is not called 'turning about and going the other way' but a 'gybe'. Launch and recovery were a breeze with such a light boat. Some notes to self about minor adjustments include 'add some sort of net or bag for stowage', 'add some deck eyes to the gunwales to help secure the oars when under sail', 'add some leather or line to the spars to stop the mast chaffing', 'add decks eyes aft to enable the rudder to be tied off amidships for rowing', 'sail more often, it is a hoot'. Thanks to Paul for the kit and to the John Harris of course for designing such a fine craft. No pics today as I has no camera crew with me...next time. Well most of the main wrinkles have been ironed out, though we still have some issues to sort. I have posted solution to some of the key issues on the build log and now it is a question of some fine tuning. The latest small issue is that I really need to bind the mast to stop the boom chaffing and also to leather the mast partner - the trickier of the two jobs. However, there's no getting away from the fact that Saffron sails like a dream and I am fast learning how to handle her. 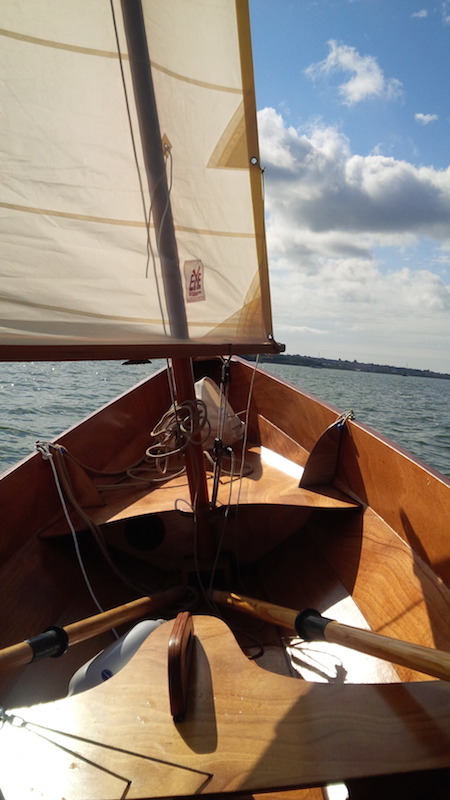 We were out in a Force 2-3 (with some very strong gusts) today on the Exe and she sailed beautifully. 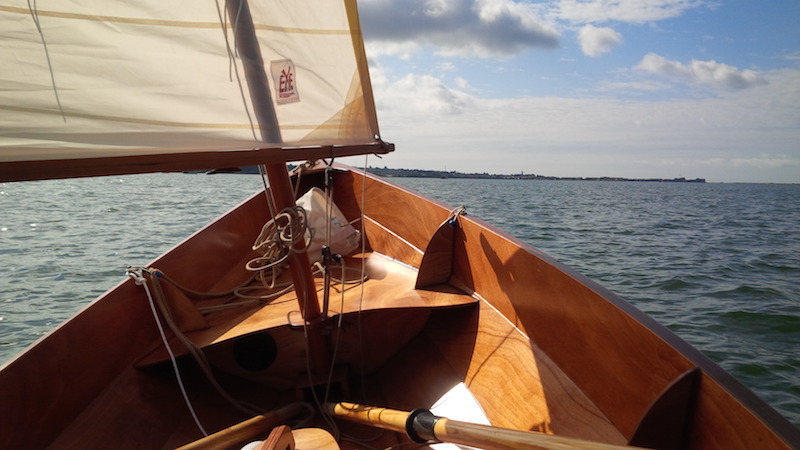 She does benefit from some human cargo to help me trim the boat, but today I sailed her single handed down river on a South Westerly breeze which gave us a fabulous tack, pretty much all the way to Exmouth. Some rather scruffy rope work and I had inadvertently put the dagger board in back to front! The issue was fixed during a lull in the blow.